Set in 1940s rural New Mexico, a boy struggles to understand good and evil, guided by an elderly curandera (healer) and the way of life in his village. 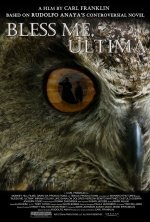 Bless Me, Ultima release date was Friday, February 22, 2013. This was a Limited in theaters release. Follows Antonio Marez (Luke Ganalon), a young boy growing up in New Mexico during World War II. When a mysterious curandera named Ultima (Miriam Colon) comes to live with his family, she teaches him about the power of the spiritual world. As their relationship grows, Antonio begins to question the strict Catholic doctrine that he has been taught by his parents (Dolores Heredia and Benito Martinez). Through a series of mysterious and at times terrifying events Antonio must grapple with questions about his own destiny, the relationship between good vs. evil and ultimately how to reconcile Ultima's powers with those of the God of his church. Based on author Rudolfo Anaya's novel, "Bless Me, Ultima".